The map below is adapted from the Standard Atlas of Howard County, Missouri, 1897 — this was just five years after Wilhelm and Theresia immigrated with their family from Germany. If I understand the map correctly, they had already enlarged theiir farm, initially just 34 acres, to about 60 acres. The surname Westhues is anglicized here as Westhouse. Notice that most tracts in the neighborhood were still owned by Southern gentry, families that had arrived in the area from Kentucky and Virginia before the Civil War: Price, Harrison, Schackelford, Lewis, Hemingway, Morrison-Fuller. Over the next 25 years, Wilhelm Westhues, his sons, and other German Catholic immigrants bought up most of the farms in this area. Surnames like Aholt, Fuemmeler, Himmelberg, Stockman, Holtwick, Schaefer, Sellmeyer, and Weber replaced the earlier American Protestant surnames. Wilhelm Westhues's goal was to establish all his children on farms of their own, as near as possible to the homeplace, in a kind of agrarian family compound. As shown in the map below, his success rate was 70 percent by the time of his death in 1921, when the horse he was riding fell and crushed him. Three sons — Theodore, William G., and Ben — were raising young families on farms adjacent to the homeplace. Son John was engaged to be married and in the process of buying the eastern half of the homeplace. Fritz, the youngest son, would buy the remaining half of the homeplace, including the original house, from Wilhelm's estate. That's five sons on contiguous farms! Meanwhile, daughters Anna Oidtman and Mary Flaspohler lived with their husbands on farms nearby. Only three of the ten children were missing from this very local map: Joseph, a priest in St. Louis; Henry, a lawyer in Jefferson City; and Theresa, who never married and died of tuberculosis in 1917. The map above is adapted from The Plat Book of Howard County, Missouri, circa 1930. The boundaries shown are not exact, since these farmers regularly bought and sold small acreages, usually in light of reconfiguration of roads. The map shows Ben and Viola's farm as being owned by John Fuemmeler. This is because, a few years after Wilhelm's death, Ben and Viola sold out and moved to Moberly, where her family lived. About the same time, Anna and Jule Oidtman moved to Jefferson City, where they ran a grocery store. Daughter Mary Flaspohler died in 1934, leaving her husband Joe with six young children. 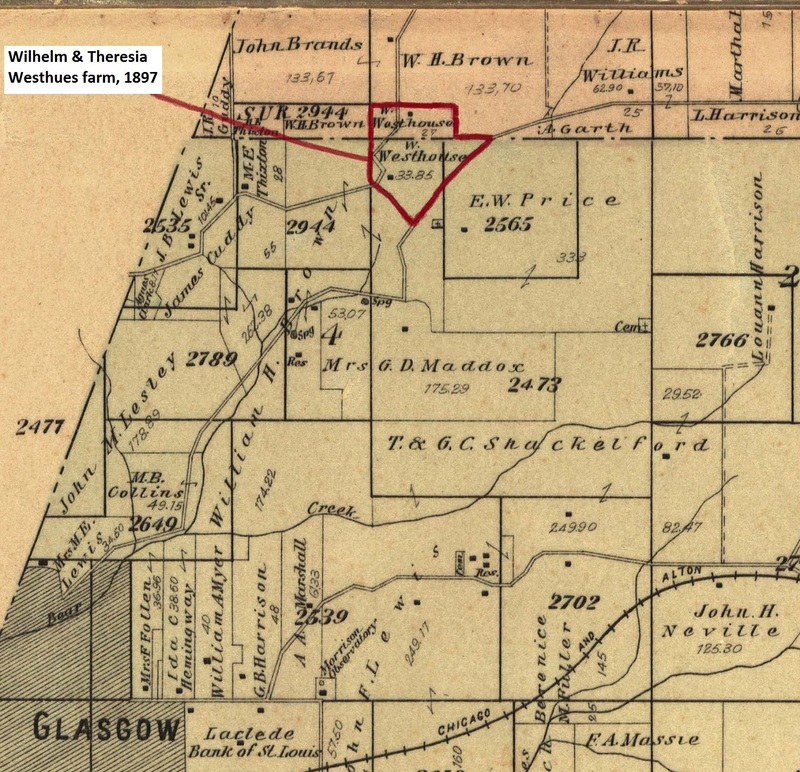 Yet even in the 1950s, 60 years after Wilhelm and Theresia's migration to America, and 30 years after Wilhelm's death, there continued to be an extraordinary constellation of farms owned by his descendants in the area along Route V northeast of Glasgow. 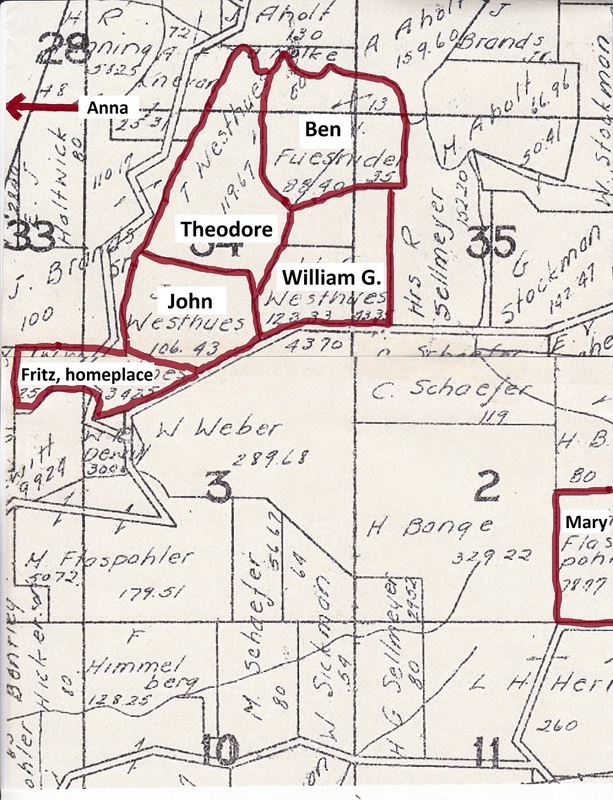 Four of the sons — Theodore, William G., John, and Fritz — still lived on their adjacent farms, as shown on the map above, At least ten additional farms in the area were being operated by members of the next generation, Wilhelm and Theresia's grandchildren. These included Theodore, Jr., Raymond, Norbert, and Rita (Tebbe), all children of Theodore and Lena; William J., Edwin, Henry, and Agnes (Vosseler), children of William G. and Emma; Mary Teresa (Miller), daughter of Mary and Joseph Flaspohler; and Joanne (Meyer), daughter of Fritz and Eulalia. Today, in the second decade of the twenty-first century, about a dozen of Wilhelm and Theresia's great- and great-great-grandchildren own and operate farms in the Glasgow area. Great-grandson Anthony and his wife Pat have lived on the homeplace since the 1970s. Their son Ray and his wife Kim are raising their family on the farm immediately adjacent, where John and Olive built the house in 1922.